All-In-One package of RND, USSEP-dependent, with spring water from wells feature included. You can free up to 7 mod spaces. ADMINS AND COMMON USERS: PLEASE NOTE that perseid9 released this mod as public domain, as you can see here. So DON'T REPORT IT AGAIN AS COPYVIOL, PLEASE. 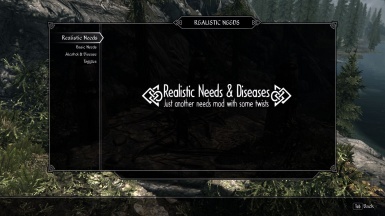 Realistic Needs and Diseases is one of the best needs mods and still used by thousands of peoples. Unfortunately its author, perseid9, has stop maintaining his mods, and so far the biggest problem is that his merged version depends on Unofficial Skyrim Patch (USKP). As we know, all the Unofficial patches have been merged into one single patch, the Unofficial Skyrim Legendary Edition Patch (USLEEP), called here Unofficial Skyrim Special Edition Patch (USSEP), so the merged version of RND is unusable if you are running USSEP. On USSEP page it's suggested how to modify .esp files in TES5Edit to change the master from USKP to USSEP. Unfortunately, if you try to follow these instructions and nothing else for RND, you will get a lot of "injected records" that severely break this mod and can cause issues and crashes. versions of RND is safe, and all the personal MCM configurations of this mod will be kept. See the list of patches made obsolete by this version under "Installation" section. Furthermore, I've added some small functionalities. You can now get spring water from vanilla wells. I've added a well activator that makes use of the original RND scripts, so by using this version you don't need the "water from wells" patches anymore (this doesn't apply for other mods that add fountains and new wells all around Skyrim). A little extended baking menu: now you can bake the USSEP "Meat Pie" and 2 new types of crostatas: "Vegetables Crostata" and "Tomatoes and Carrots Crostata". These 3 items are also occasionally sold by innkeepers. Dumplings have now a little different textures: while Chicken Dumpling has the vanilla one, Lavender Dumpling has some purple mottles and Apple Dumpling has some yellow-red mottles. You can loot slaughterfish meat from slayed slaughterfishes. 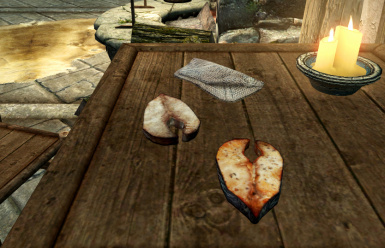 So now you can cook Seared Slaughterfish at the cookpot (looting not available for "Harvest Overhaul Creatures" users, because that mod brings its own slaughterfish meat - Seared slaughterfish recipe hidden but not removed). Now you can use the cookpot to cut cheese wheels into 12 wedges (more balanced as it's strongly based on the wedges' shape) and sliced cheese wheels into the equivalent wedges (7 for goat and 11 for eidar). Innkeepers can sell "goat milk", useful to create cheese wheels along with salt ad thistle (used as rennet). These crafting records are shown only if you have goat milk in your inventory. 9 new foods: "Custard", "Wolf Meat Stew" (based on Dog Meat Stew), "Bear Stew", "Boar Stew", "Goat Stew", "Horse Stew", "Ash Hoppers Stew", "Ash Yam Soup" and "Mammoth Fondue". Small improvements on the original "animal loot": now you can get also 2 tusks from dead mammoths, 3 tusks from dead horkers, 2 eyes and 2 teeth from dead sabrecats, 3 feathers from hagravens (not available for "Harvest Overhaul Creatures" users). You can now create empty bottles at the forge using 1 glass (doing just the reverse of putting bottles into the smelter). These crafting records are shown only if you have glass in your inventory. Again, no new scripts were added to this mod. I suggest you to use also Ovens and Churns of Skyrim (by Omeletter, - still not available for SSE, but you can use the oldrim version since it has no .bsa archives) to have ovens and churns available all aronud Skyrim and increasing immersion and cooking experience. New crostatas and mottled dumplings. Slaughterfish raw meat and vanilla "Seared slaughterfish". * Drag and drop the .ESP and the .BSA files into Skyrim's Data folder, or let it manage by your Mod Manager, if you have any. Overwrite the old RND if you were already using it. So with this mod you can disable and remove them from your load list. If you are using Havest Overhaul Creatures, please use the dedicated version in "Optional files" section instead of the main file. This version doesn't have the RND_AnimalLoot.esp merged, so it is compatible with Harvest Overhaul Creatures. If you are only using Harvest Overhaul (without "Creatures" patches), you can use the main RND file (no conflicts). NOTE: If you are using other mods that add wells and/or new foods/drinks (ETaC, Fountains of Skyrim, Falskaar, Wyrmstooth, etc. ), you still need their RND patches. You can find them on the RND original pages and/or on the Nexus as stand-alone mods. Q: I know there is also RND 2, that was retired and published again. What's different? compatibility and much less complications when uninstalling; disadvantages are obviously missing functions like widgets and so on. Both versions bring water from well functionality. Other differences area few more recipes included in my versions, the slaughterfish raw meat support and some small tweaks. Generally speaking, I created this version of RND only having strongly in mind the original mod's behaviour, as intended by its author. Q: I'm following Beyond Skyrim project, most probably they will come out with new foods and drinks. Will you provide a patch for Beyond Skyrim? A: I'm a member of Beyond Skyrim, so yes, I'll do. 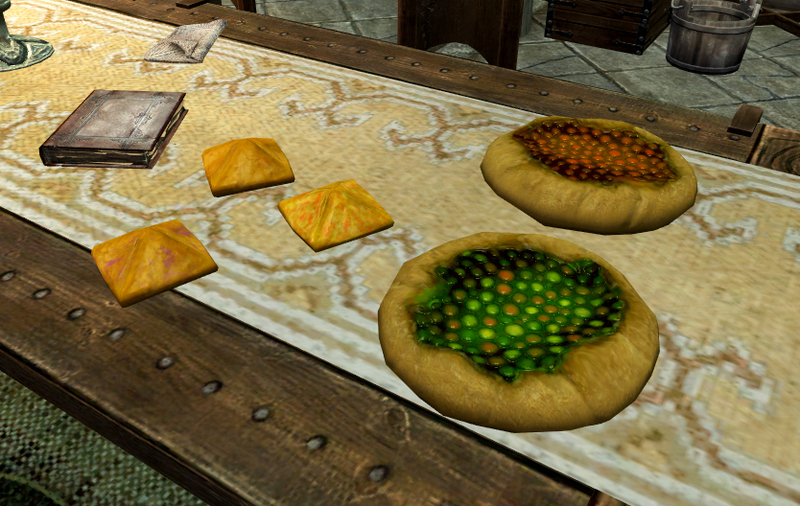 Indeed, a patch for Bruma is already done and working perfectly, and I will publish once Bruma will be released. Q: Why didn't you add the RND_[random-mod]-Patch.esp to this package? A: Because not every peoples are using the same mods. I've added here only the patches necessary to make RND work properly with the vanilla Skyrim. Any other mod that adds food or drink types will need their own RND patch. This is the price we must pay if we want such an immersive mod like RND. Anyway, with my merged version you can free 7 esp slots. Q: Can you make translations of this mod, please? A: My Skyrim is in italian and I have the TESVTranslator dictionary only for italian and english. You can ask to translate this in your language to peoples who made already the translation of previous versions of RND using TESVTranslator. I've added only less than 10 new items that need translation, so if they have the sst dictionary for RND, it takes only 1 minute to translate it again. Many sincere thanks to perseid9 for his fantastic mod Realistic Needs and Diseases. My personal game experience became really more pleasant. All credits belong to perseid9, even if he said he released his mod in public domain now. So please, if you are new to RND, endorse at first the original RND published here.